Each High Trek Trekking Pole can be adjusted in length from 26″ to 53″ by unlocking their “Twist-Lock” mechanism which is built to quickly adjust while preventing accidental retraction. The hiking poles come with mud/snow feet which quickly attach to the bottom to prevent the poles from sinking into softer material. These trekking poles are collapsible and weigh only 11 ounces and retract to 26″ they are easily stored when not in use. These poles are suitable for men and women. The poles are made with Aerospace-grade 7075 aluminum for lightweight strength and weigh around 11 ounces. The handles are plastic, which is great for durability but not so great for “give.” Some owners though a different material would have made them more comfortable. As is common, there’s an adjustable wrist strap and a foam grip area just below the handle for carrying the poles when not in use. The High Trek hiking pole’s range of adjustment (26 – 53 inches) is similar to that of the Hikker, and there’s a measured section in the middle for quick setting. The High Trek also uses the same kind of rotational lock as the Neewer. Rather than a metal tip, however, the High Trek has a rubber tip. Each hiking pole comes with mud/snow feet which quickly attach to the bottom to prevent the poles from sinking into softer material. 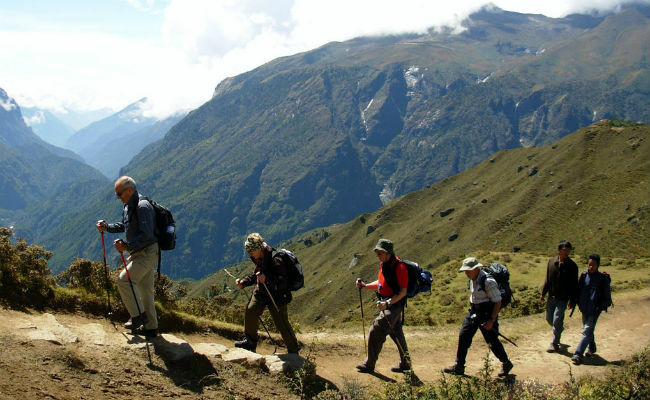 High Trek trekking poles are what many would consider ideal entry-level equipment. 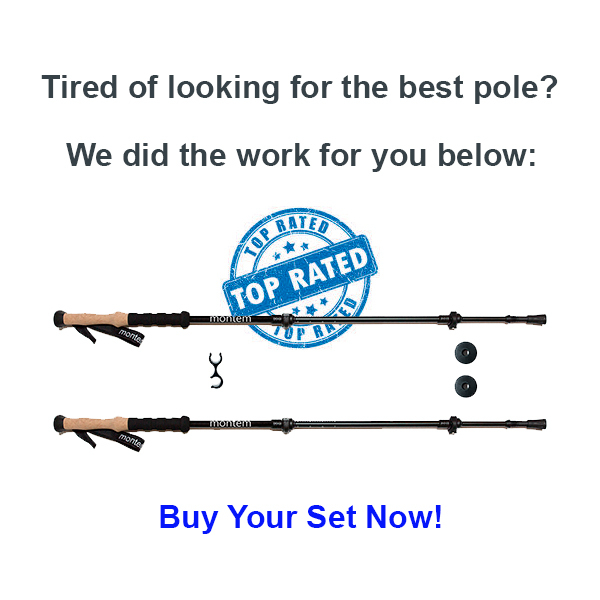 They’re great for those who want to try poles without spending a lot of money. These supportive poles are of a higher quality than the BAFX model, although they too receive some criticism in terms of occasional breakage and problems with the twist locks. The High Trek poles perform at their best in moderate conditions; they’re not designed for “extreme” outdoor challenges. 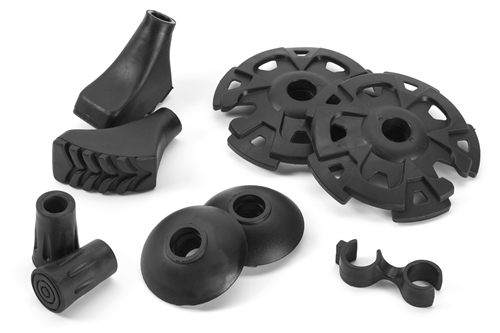 On rare occasions, the carbide tips and rubber ferrules have been known to fall off. In terms of trekking equipment, these poles are toward the lower end of the price range. Adjustability is on par with most other poles on today’s market. The main difference between these poles and others is their lower weight. At first glance, there’s little to separate these poles from the BAFX Products Trekking Poles. They share a similar design and have a similar extension range. 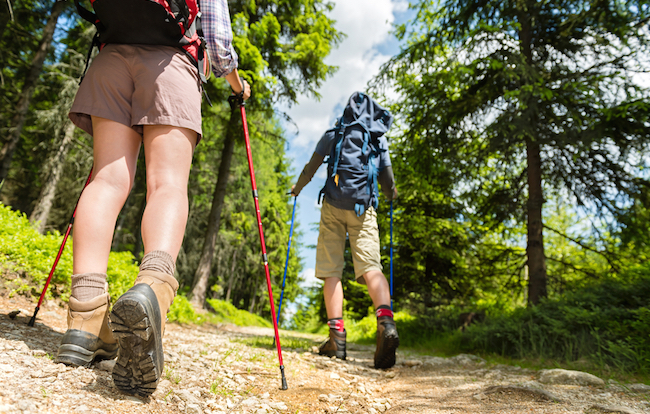 According to our research, BAFX hiking poles are considerably more popular. You can purchase them directly at Amazon.com here. There is not other place you can buy them! These High Trek trekking poles are very lightweight and sturdy, with a collapsible telescoping design, adjusting from 25.5 to 53 inches which makes them versatile for varying terrain heights (as well as people of different heights) and easy to store (with a nifty little clip that connects the two poles together for storage). They are great beginner poles. They don’t seem durable and broke easily in rough terrain. In addition, the grips got uncomfortable after an hour of use.